For all that thou hast given to help us and delight us. We thank you, Lord, for these. 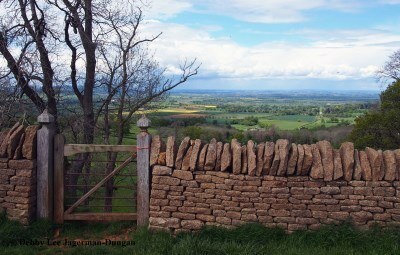 My husband and I spent 12 glorious days walking around the Cotswolds last May. 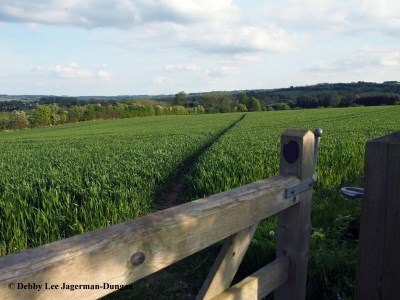 Of the 3,000 miles of public footpaths and roads, tracks and trails, that take you through farmland and pastures, fields and crops, rolling hills and valleys, open grasslands and gardens, forests and huge flowering trees, parks, nature reserves, wildflowers, and rivers and streams, we walked 100 miles. We visited no-less-than-39 historical churches, and an equal number of timeless villages, small hamlets, and medieval market towns. 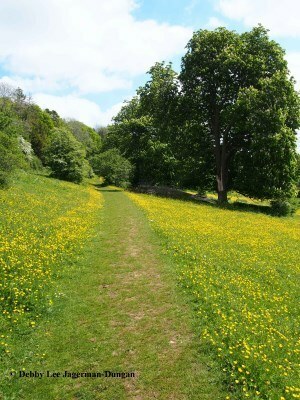 Designated as an “Area of Outstanding Natural Beauty,” the Cotswolds are located in south central England, and consist of an area approximately 2,250 square miles. 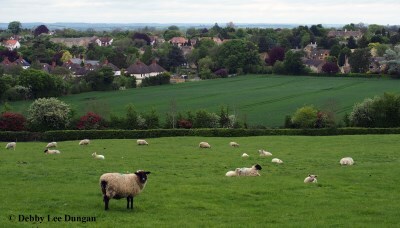 The word “Cotswolds” itself is a combination of two old-English words which literally translate to “sheep hills.” Historically, during the Middle Ages, the Cotswolds were “the heart of England’s vast wool trade” due to its abundance of sheep. With this great prosperity from hundreds and hundreds of years ago, because of the sheep and the wool business, manor houses, tithe barns, abbeys, and “wool churches” were built. Many of these buildings still stand today. I present my travel guide to the Cotswolds based on our walking, and on the 19 blogs that I have written from these travels. I include links within each section to my blogs for further reading. The land in most of England is considered “public rights of way,” meaning that land that we might consider private and trespassing on in the United States, is free to walk through in England. 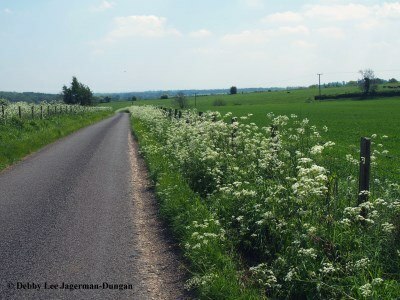 There are established and well-marked footpaths and roads, and tracks and trails throughout the countryside and towns, some even literally going through someone’s property. My husband and I were provided with Ordnance Survey maps, a guidebook, and pages and pages of laminated, very detailed written instructions from Footpath Holidays, who organized our travels. With these we were able to navigate our way around. Written signs along on the paths and roads that said for example, “public footpath” or “public bridleway,” or a naming a specific route or “way,” also helped our navigation. There were directional arrows, and distinctive symbols as well, such as the acorn, which is the symbol used for all National Trails in England and Wales, to point us in the right direction. Along with our written instructions, maps, and guidebook, it was these signs and symbols, acorns and arrows that helped us find our way in the Cotswolds. 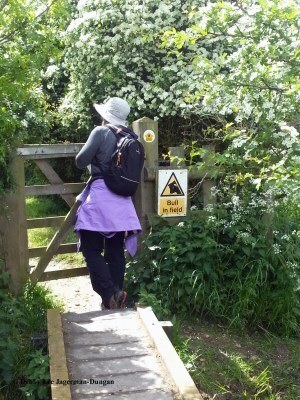 To connect the dots between the footpaths and roads, tracks and trails, and the signs and symbols, acorns and arrows, we passed through gates, kissing gates, and stiles which joined one landscape to another. 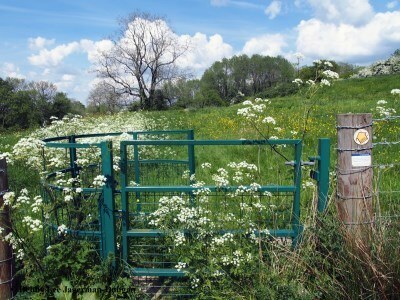 One very important rule to follow is to very carefully please close all gates and kissing gates, and leave them as you found them. We spent our days walking through some beautiful scenery, including all that I described above in the first paragraph. Green was the dominant hue, but flowers, trees, water, and sky added a rainbow of color. 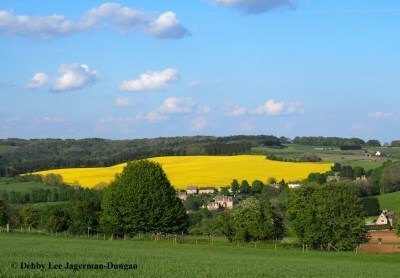 There was such a variety of scenery during our walks, including some big trees that I have never seen before, and some bright yellow fields of rapeseed in bloom. 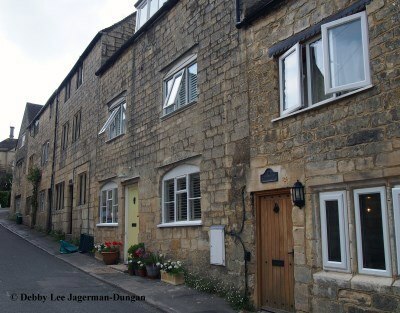 The buildings of the Cotswolds are known for their “Cotswold Stone,” a Jurassic limestone, rich in fossils, which it gives the historic homes, hamlets, and villages their honey-colored and golden-colored look. Some of my favorite buildings were those that have flowers and plants that literally grow on and climb the walls, such as wisteria or roses. 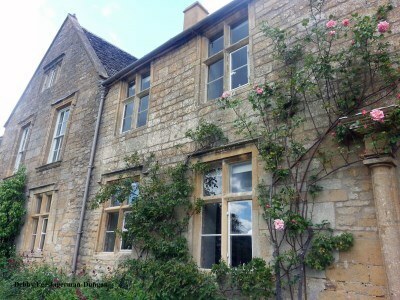 This made for a nice color combination between the Cotswold stone and splashes of purple, pink, red, and other colors. 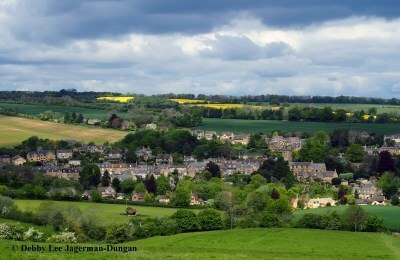 We strolled from towns called Stanton to Chipping Campden. 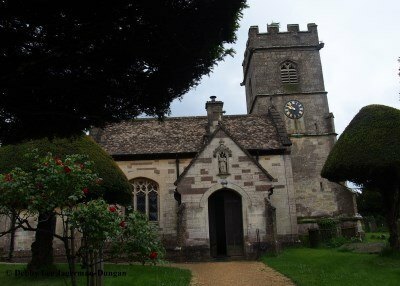 From villages called Guiting Power to Temple Guiting to Snowshill. From Coln St. Denis to Coln St. Aldwyns. Names such as Broad Campden, Batsford, Blockley, Bibury, Bisley, Burford, Buckland, Bourton-on-the-Hill, Bourton-on-the-Water, and Broadway. Even the names of the towns were colorful. I loved the sheep! I loved walking through pastures with them right at my feet. I loved hearing them “baaaaa,” and seeing the little lambs frolic. 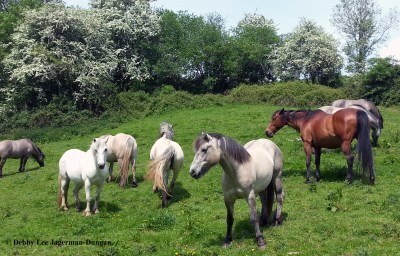 My husband loved connecting with the horses, as we walked through their fields, or near their stables and corrals. And together we had some interesting experiences, needing to “take the bull by the horns,” as we walked near some cows and bulls! 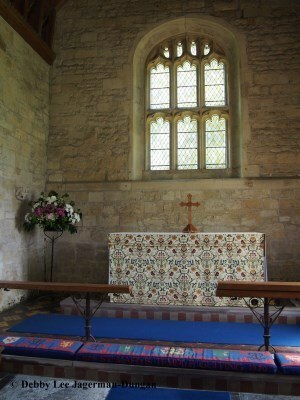 Even the kneeling pillows in the churches reflected the beauty of the Cotswolds. 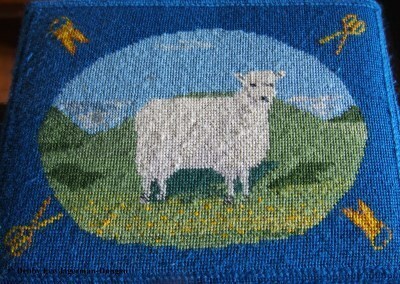 I adored the creative embroidery and needlework that included not only religious symbols, events, and holidays, but also a variety of other subjects, including flowers and nature, designs and patterns, birds and wildlife, the churches themselves…and the sheep. Throughout England you still see remnants of the classic red telephone box and red post office box. With the advent of cell phones, the telephone boxes have other uses these days, even in the Cotswolds, such as a Public Access Defibrillator. 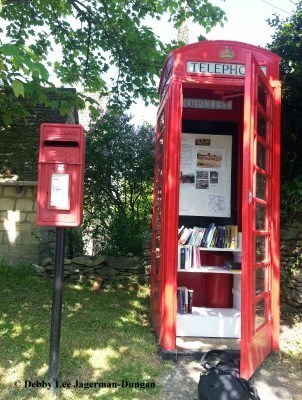 Or my favorite, in the hamlet of Calcot, the red telephone box was a combination of the “Calcot Visitor Information” area, complete with the hamlet’s history and some photographs, as well as a miniature library/book exchange. 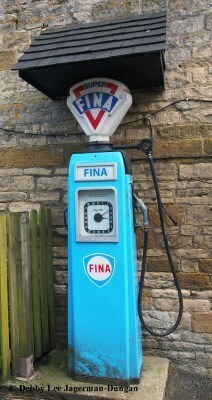 We came across a few classic old petrol pumps as well. My favorite subject to photograph when I travel is windows and doors. The Cotswolds was no different. 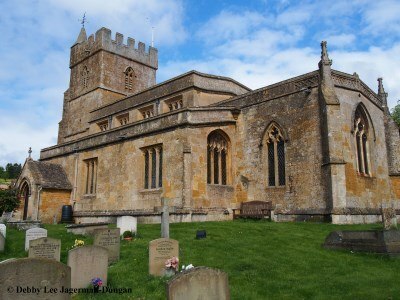 I have turned my photographs of the Cotswolds into a travel photography book, with over 375 photographs in 192 unnumbered pages, including pictures of windows and doors of the homes and buildings, and pictures of interior windows and exterior windows and doors of the churches. 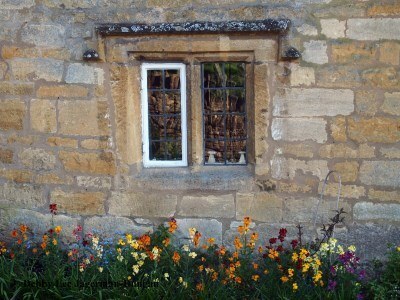 The photographs in my book reflect the quintessential contrasting and complementary colors of the flowers and plants that literally grow on and climb the walls of the honey- and golden-colored “Cotswold Stone” of the homes, buildings, and churches. 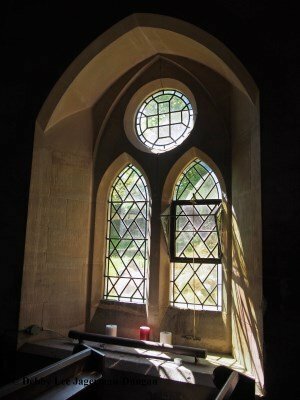 My pictures are my representation of the beautiful and timeless Cotswolds as seen through its windows and doors. 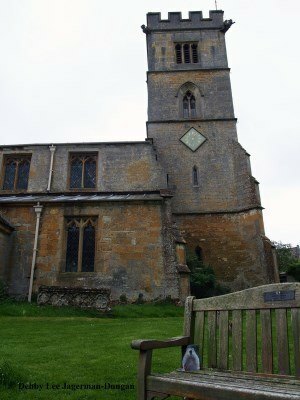 I won first place in the International Category of the “Worldwide Adventures of Punxsutawney Phil” photography contest with one of my pictures taken in the Cotswolds of Phil sitting on a bench at Saint Michael’s Church in Buckland! The premise of this contest is that the Groundhog Club provided me with a picture of Punxsutawney Phil that my husband and I took with us on our travels, both nationally and internationally. The background as to why I wanted to take Phil with us on various adventures is because, well, my birthday is on Groundhog’s Day. Three years ago, I walked 150 miles the Camino Francés pilgrimage route across northern Spain, and will soon be going back to walk the entire 500 miles of this Camino de Santiago pilgrimage route. 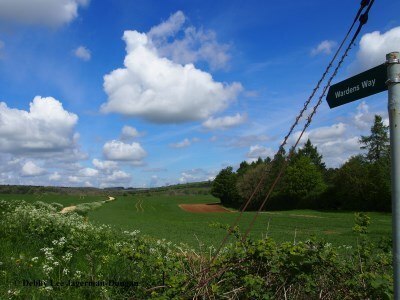 During our walk in the Cotswolds, I ended up discovering a few commonalities between the Cotswolds and the Camino de Santiago. My husband and I thoroughly enjoyed our 12 glorious days walking around 100 miles of the Cotswolds. I look forward to someday returning to explore some of the other 2,900 miles! 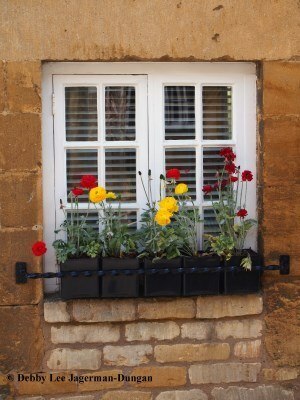 My travel photography book, “Windows and Doors of the Cotswolds: A Collection of Photographs of the Quintessential Colorful Flowers and Honey-Colored Cotswold Stone in the Land of Market Towns, Wool Churches, and Sheep Hills in England’s Countryside” is available on Amazon.com and on Amazon.co.uk. Footpath Holidays organized our journey to the Cotswolds, and provided a small discount on our total fees. Opinions in this blog are my own. Their blog is More Than Just Walking. 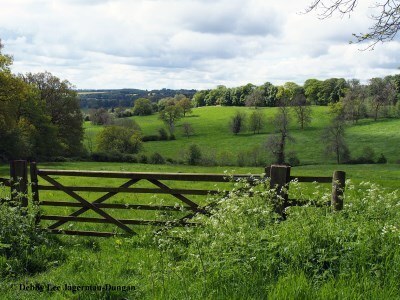 This entry was posted in Cotswolds England, My Travel Guides and tagged Cotswolds England, My Travel Guides by debbysdepartures. Bookmark the permalink. Love love love this! So much work! So fun to read!